Convert Video to Any Format on Mac and Windows without Any Quality Loss! 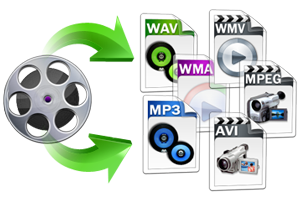 Convert All Popular Video and Audio Formats, such as MXF, MTS, MOV, MP4, etc. Support Presets for Almost All IOS, Android, and Windows devices. 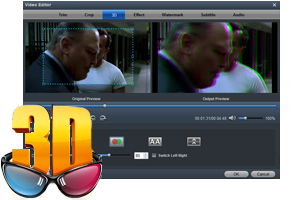 Edit Videos through Trimming, Cropping, Adding Watermarks, Insert Subtitles, etc. 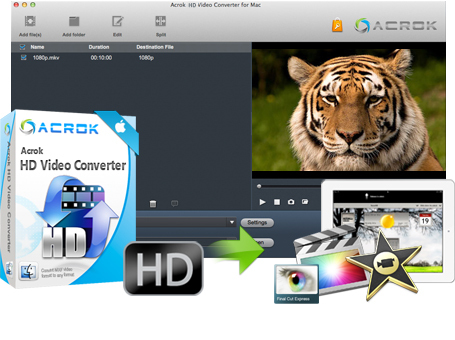 Acrok HD Video Converter is a splendid 4K, 2K, 1080P and 720P video converter on Mac OS X (EI Capitan and Yosemite included) and Windows (Windows 10, 8, 7 included) which helps you perfectly convert any HD files to almost all the popular video formats such as MP4, MOV, AVI, WMV, FLV both in SD and HD for playing on mass portable devices or home theater (iPad Pro, Surface Pro, Galaxy Tab S2, Xperia Z4 tablet, iPhone 6S, GalaxyNote 5, etc. ), editing in Mac and Windows editing program (Final Cut Pro, iMovie, Premeire Pro, FCE, Avid, Sony Vegas Pro, Windows Movie Maker, Premeire Elements, etc. ), uploading to YoTube, Google, FackBook, etc. Acrok HD Video Converter allows you not only to convert wide range of 4K, 2K, HD and SD videos regardless of formats, but also lets you convert those recorded, downloaded or homemade videos to any popular video and audio formats for play and share anywhere you like. Converting HD/SD videos from nearly any format to a selection of modern, widely supported codecs. Convert audio like MP3, M4A, WAV, AAC, FLAC etc to any other audio format on Mac. It can also extract audio from video files. Mainstream video formats such as MXF/MTS/M2TS/Tivo/MOV/M4V/MP4/AVI/WMV/FLV/F4V are well supported to convert to each other; moreover, NLE video codecs are supported smoothly like ProRes for Final Cut Pto, AIC for iMovie/FCE, DNxHD for Avid, H.264/MPEG-2 for Premeire Pro/Sony Vegas Pro, and so on. Follow the pencil-like icon on the top to locate the 3D editing feature. It offers Red-Blue, Red-Green two effects and details settings includes Depth and Color Control. Let you play 2D movies on 3D devices via 3D effects easily. Hot Device Supported Apple Device iPad Pro, iPad Mini 4, iPad air 2, iPad Air, iPad 4, iPad mini, iPad 3, iPad 2, iPad, iPhone 6, iPhone 6 Plus, iPhone 6S, iPhone 6S Plus, iPhone 5S, iPhone 5C, iPhone 5, Apple TV 4, Apple TV, iPod Nano, iPod Classic, iPod Touch 6, etc. Game Console Xbox 360, PSP, PS3, Wii, NDS. Mobile Phone Android Phone, BlackBerry Phone, Windows Phone, Symbian Phone. Tablet Amazon Tab, Samsung Tab, BlackBerry Tab, HP Tab, Dell Tab, Motorola Tab, ARCHOS Tab,ASUS Tab, Toshiba Tab, Lenovo Tab, Acer Tab, HTC Tab, Google Nexus, Gigabyte S1082. 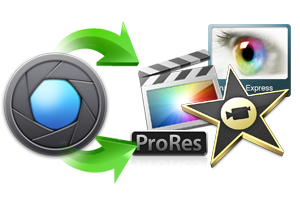 Output Programs Supported Avid Media Composer, Adobe Premiere Pro, After Effects, Window Movie Maker, Window DVD Maker, MAGIX Movie Edit Pro HD, Corel VideoStudio Pro, Sony Vegas Pro 12 Editing, CyberLink PowerDirector, Pinnacle Studio, Clesh, etc. iDVD, Roxio Toast, Disco, Burn, DVD Studio Pro, Encode, Imgburn, Nero Lite, etc. YouTube, NAS, Networked Devices, MSN, Myspace, Facebook, Google, Yahoo, Dailymotion, FOX, NBA, Youku, NAS, PowerPoint Rresentation, PDF, HTPC, Home Theater, A/V receiver, LCD Projector, Keynote, etc.